The Utah State University Eastern Eagles baseball team looks to rebound after a tough weekend in Douglas, Arizona. Douglas is a small Arizona town situated on the Mexican border. After a lengthy 14-hour bus ride the day prior, USUE continued their pre-season against Cochise College on Feb. 1. Cochise, who is just a year removed from a trip to the NJCAA World Series, proved to be too much for the Eagles to handle as they swept the four game set. The Eagles didn’t go quietly however, losing three of the four by a combined four runs. Game 1 was a pitcher’s duel as Cochise’s ace outdueled Karter Pope, who pitched well, going ve innings allowing just two runs. However, the Eagles offense wasn’t able to produce enough runs to back their ace, dropping the game 2-1. Game 2 was a slugfest that, despite the Eagles racking up 12 hits as a club, they dropped 7-9. Tanner Evans, Dylan Rodriguez, Wyatt Barrus and Brantzen Noble all had multi-hit games. After getting into some trouble in the first inning and allowing three runs, Cooper Kunz settled in to throw four scoreless innings. In that time, the Eagles battled back to take a 4-3 lead, scoring one in the fourth inning and three in the fifth. 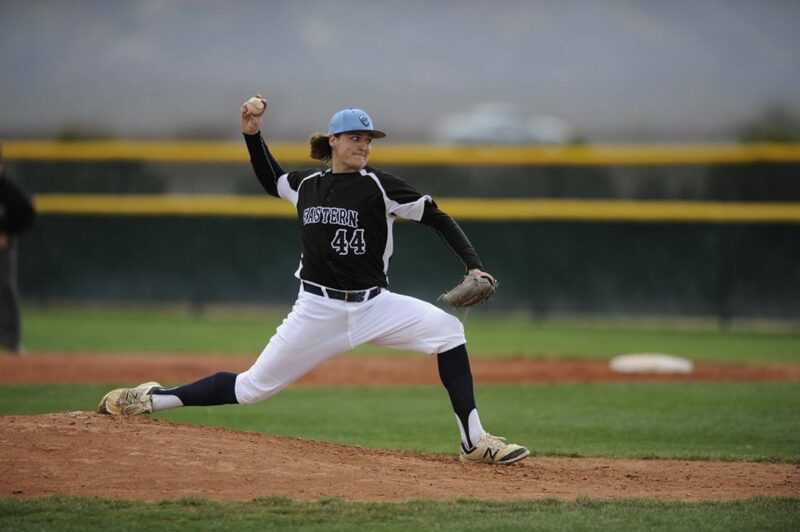 They turned to sophomore pitcher Jake Smith to stop the Cochise bats in game 1. Smith didn’t disappoint, as he threw six innings of one run ball, while striking out six. He threw so well in fact that coach Scott Madsen allowed him to go back out for the seventh inning, with the game tied at one. After allowing a double to the leadoff batter, Madsen pulled the plug on Smith’s brilliant outing and turned the ball over to sophomore Hunter Porritt, who also pitched a scoreless inning in relief the day before. The first batter Porritt faced bunted the runner on second over to third in a sacrifice. That left the Eagles in a jam. With a runner on third with only one out, all Cochise needed to do was put a ball in play, and it would likely walk them off to a win. Porritt wasn’t having any of that though, as he carved up the Cochise batter, blowing an 0-2 fastball by him for a key strikeout. Porritt got the next batter to y out to force extra innings. When Eastern went quietly in the top of the eighth, Porritt returned to the mound for his second inning of relief. After quickly notching the first two outs, he struck out the Cochise three-hole hitter but catcher Wyatt Barrus was unable to squeeze the pitch, allowing the ball to trickle to the backstop and the batter to reach first on a dropped third strike. This miscue proved to be costly as the next batter roped a two-out-walk- off RBI double that scored the winning run. After dropping their third game in heart-breaking fashion, the Eagles didn’t play well in the nal game of the set, losing it as well. The good thing about baseball and the pre-season is that there is an opportunity to learn from the mistakes made and move forward. Eastern will look to bounce back in their next series. Next up is the home-opener for the Eagles, as the play Dawson Community College in Price on March 1 and 2.